Bloomingdale rowhomes. Image created with Google Maps. With 11 new historic districts in the last five years, the percentage of the city’s buildings designated historic is growing rapidly. Based on targeted and interested new neighborhoods, that growth doesn’t look to be slowing down any time soon. DC preservation law provides two ways to designate a building as historic. It can either be nominated as an individual landmark, or it can be included with a group of similar neighboring buildings and designated as a historic district. In DC’s 2016 historic plan (released in 2013), the city recorded 657 historic landmarks and 55 historic districts for a combined 26,749 historic properties. That total represented 19.4% of the properties in the district. As contributor Payton Chung noted, that's the highest rate among major US cities — even higher than older cities with similar historic merit like Philadelphia, Boston, and New York. Data from National Trust for Historic Preservation. Image by Payton Chung. Five years later, the updated 2020 version of the historic plan documents an additional 52 landmarks and nine new historic districts (plus two more districts approved since the plan was released at the beginning of this year, Bloomingdale and Kingman Park). 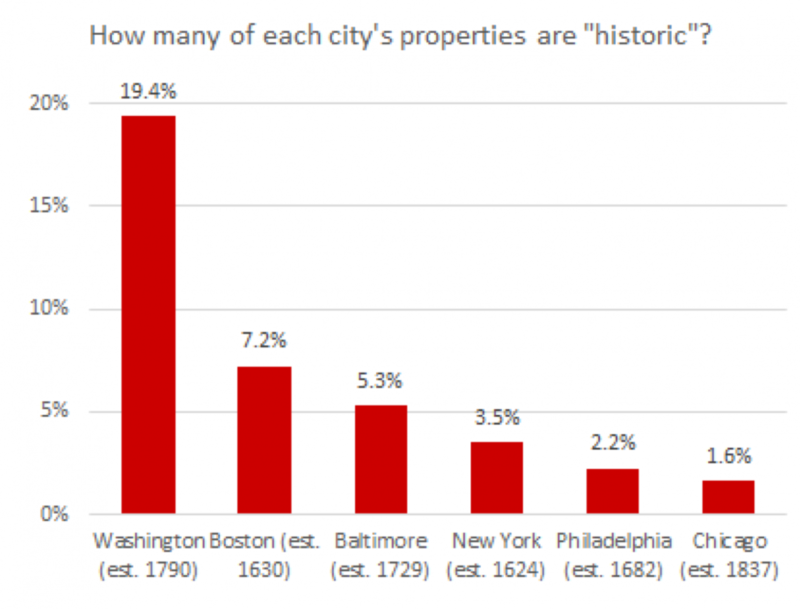 The total number of historic properties is now almost 30,000 — putting the percentage of the city designated somewhere over 20%. (HPO reports the exact number will be included in their updated 2020 plan due this fall). Of those 11 new districts since 2013, seven of them are neighborhood historic districts (as opposed to parks, campuses or military sites). 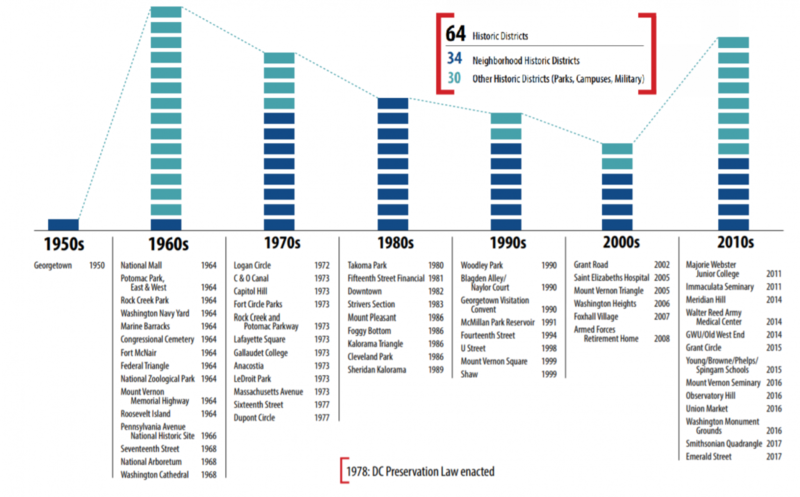 Their designation has already made the 2010s the most prolific decade for declaring neighborhood districts historic since the 1980s, the first decade after the 1978 DC Preservation Law. Source: 2020 DC Historic Preservation Plan. Newly designated Kingman Park and Bloomingdale districts not included. Applications (some long stalled) that are currently pending before HPRB. This includes an expansion of the Downtown Historic District in Chinatown and Barney Circle. Neighborhoods like Columbia Heights, Lanier Heights, Northwest Rectangle and Congress Heights that are mentioned in official HPO planning documents like the 2020 Historic Preservation Plan and individual Ward Heritage Guides. Neighborhoods like Hill East and Southwest that are listed as “Endangered Places” by the DC Preservation League, the district’s preeminent preservation organization that files and supports large numbers of nominations. Communities like Trinidad and Burleith that are currently discussing whether to apply for designation. Neighborhoods like Brookland, Chevy Chase, and Eckington that applied for or considered applying for designation in the past but withdrew for lack of community support (which is now a more explicitly non-limiting factor). How will this increasing number of historic districts impact the city’s other priorities of accommodating growth while minimizing displacement and unaffordability? Will rising designation shunt more development into the shrinking number of un-designated neighborhoods, and will they react by advocating for similar designation themselves? A more comprehensive planning process (something GGWash has been advocating for) would proactively integrate these preservation questions, instead of punting them down the road when it might be too late.